Everyone is looking for creative ways to solve today’s issues. You don’t have to be a writer, artist, or musician to enjoy this book: Collins covers topics on how to organize your thinking and maximize your habits to become faster and more productive. But if you are a “traditional creative” type (or want to learn to be one), the best thing about this book series is it’s *practical*. He pulls stories from history and psychology to illustrate his ideas, which are all written in bite-sized chunks. His writing is very clear and down to earth. My favorite book in the series is the second one on how to master your “inner genius”. Collins reassures the reader that no one is born a genius: it all depends on what is done with the thoughts you already have. He uses the analogy of putting on six thinking hats to help the reader shift perception and realize their own potential. 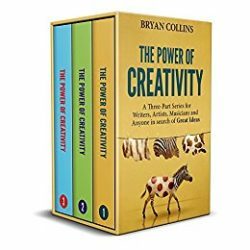 If you can’t find at least one thing that helps you be more creative in this book series, then you must have your eyes closed. Bryan’s books are packed with useful tips and suggestions! Highly recommended for anyone who has thoughts and wants to do more with them!